“I kill a man and the world forgives me. 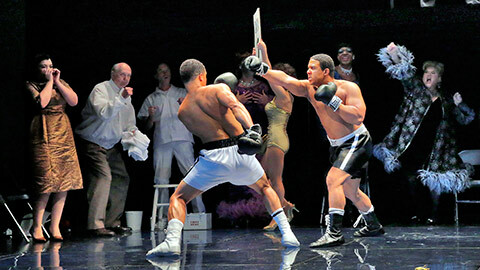 I love a man and the world wants to kill me.” The story of Emile Griffith–the closeted gay welterweight boxer whose knockout of a homophobic rival led to unexpected tragedy–comes roaring to the stage in this riveting and haunting opera. Through flashback, an aging Emile reflects on his tumultuous life, from his Caribbean upbringing and conflicted sexuality to his meteoric rise in the ring and ensuing decline in health. Battling years of guilt, regret, and denial, he now faces his greatest fight: to come to terms with his true self. Musicologist Saul Lilienstein leads the Wednesday, Mar. 15 Opera Insight, starting 1 hour and 15 minutes before the performance and lasting 35–40 minutes. All other Opera Insights start 1 hour before the performance and last 20–25 minutes. Informative and entertaining, Opera Insights take you inside the composer’s mind, behind the scenes of planning a production, and into the history and social context of each opera. These lectures are free, but patrons must present a ticket from any performance of Champion. Don’t miss your opportunity to engage directly with our artists and share your thoughts on the experience you just had! Here’s your chance to ask questions and get the inside scoop on the production from members of the cast and creative team.